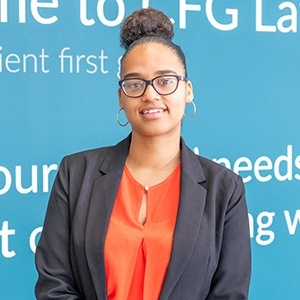 Elizabeth is a Trainee Solicitor at CFG Law and joined the team in 2018 as a Paralegal. Elizabeth enjoys the nature of personal injury work and that each and every case is different in its circumstances. Elizabeth is a caring person and helps to look after our clients with extreme efficiency and attention to detail. She understands that communication is essential when guiding people through the claims process and always lets her clients know what is happening with their claim. Putting herself in her clients’ shoes to appreciate their feelings and find out how she can best support them and their family. Understanding clients’ frustrations and communicating fully with them, so they know what is going on with their case. Pursuing claims with passion and enthusiasm to get the very best results. The complete focus on clients’ wellbeing and ensuring care and support is in place to make a real difference. The welcoming atmosphere in the office with friendly colleagues to offer a helping hand. Researching a case fully and finding out all of the details. The complex nature of serious injuries and learning about different injury types and the complications that can arise. Following legal updates and keeping on top of changes to legislation. Gym and fitness, go-karting and paintballing!